To report trees or limbs in conflict with CWLP lines (non-emergency), please call 217.321.1407 or email carl.tega@cwlp.com. For emergencies and 24-hour service contact Electric Dispatch at 217.789.2121. To report other tree trouble for those on City Right of Way and not in conflict with electric lines, please contact the City of Springfield’s Office of Public Works at 217.789.2255 or public.works@springfield.il.us. If a power line runs through a tree that is located on private property, is CWLP responsible for trimming that tree? It depends. CWLP is responsible for trimming or removing trees that conflict with high-voltage primary electric wires. So, even if a tree is located on private property, if it conflicts with primary electric lines, it is CWLP's responsibility to trim or remove the tree. Maintaining/repairing the service line—the wire that delivers power from the service transformer to a customer's building—is the customer's responsibility. Therefore, it is technically the property owner's responsibility to resolve any issues involving a conflict between a tree and his own service line (regardless of where the tree is located). However, there can be circumstances under which CWLP might determine it is in the best interest of the utility to assist a property owner in resolving at least some part of a tree and service line conflict. Therefore, we encourage you to contact our Line Clearance Supervisor at 217.321.1407 or carl.tega@cwlp.com) for questions about tree and power line conflicts for both primary or secondary (service) wires. The CWLP line clearance supervisor will assess the situation and determine whether the utility or you will be responsible for the work. If he determines the branch removal/trimming is your responsibility, he might recommend you hire a professional to do the job. If the line clearance supervisor determines it is in the best interest of the utility to have his crew resolve a conflict between a tree and a customer's service line, the crew will do only the minimum amount of work needed to fix the immediate problem. For instance, let's say a large branch from a nearby tree is leaning heavily against your service line (or a branch has fallen onto the line) and its weight is placing a great strain on the wire. The line clearance supervisor might determine the most efficient thing to do (from the utility's perspective) is to have his crew remove the branch. However, the crew would remove only that branch. Any further trimming to reduce the likelihood of a similar problem in the future will be your responsibility. If the branch has in any way damaged the wire, strained the wire so much that it has pulled the meter away from the house, or caused any other damage, the repair will be your responsibility. What Should You Do If You Are Required to Clear Your Service Line? If you or a tool you are using while trying to clear branches from your service line should come into contact with that wire, you could be severely injured or even killed. So for your safety, whenever you, a friend or family member, or a hired contractor will be doing any type of work on or around your service line, CWLP urges you to contact the utility to arrange to have power to the line temporarily shut off—and, when applicable, to have the line temporarily taken down—while you perform the work. To schedule this free service, call 217.321.1409 or email carl.tega@cwlp.com a few business days in advance. Remember, too, you will be responsible for repairing any damage caused to the service wire during the course of your tree trimming or any other activities. So having the wire temporarily moved out of your way could guarantee the safety of your wallet as well as your health. When tree trimming is undertaken as part of our routine maintenance program, CWLP is responsible for all waste cleanup and removal. When trimming must be undertaken in response to an act of God (e.g., removing branches or trees that have fallen onto power lines during a storm), CWLP is not responsible for waste cleanup and removal. All the utility is required to do is to clear (and, if necessary, repair) the power lines so as to restore service to customers. The utility also is not responsible for cleanup and removal of any waste created when one of its crews clears a branch away from a customer's service line. As part of our overall tree trimming (line clearance) program, CWLP strives to educate customers about how they can work with the utility to reduce tree and power line conflicts. We offer our customers a free pamphlet on this topic—Trees and Power Lines: They Don't Mix. The pamphlet can be ordered online or by emailing the Public Information Office. A copy of the pamphlet is also available for viewing below. If you are considering planting a new tree, make sure you choose and a proper planting site so that, when it reaches maturity (or before), the tree will not conflict with nearby power lines. 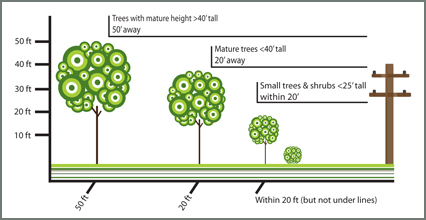 Use the graphic below as a guide for how far to plant various-sized trees from overhead lines. For its efforts to maintain Springfield’s urban forest, CWLP has been named a Tree Line USA utility by the National Arbor Day Foundation. The utility is also a member of the American Public Power Association’s Tree Power Program, which promotes the planting and care of trees in urban centers, as well as utility programs aimed at educating the public about the benefits of urban forests. The illustrations below depict the three tree trimming methods utilized by CWLP to direct the growth of tree branches away from overhead power lines. Each of these methods is approved by the National Arborists Association and is designed to allow the trees to re-grow as naturally, beautifully and healthily as possible.